It is easy to believe that the John Calvin of legend sought to excise anything men and women might associate with joy and celebration. Even his contemporaries imagined his supposedly theocratic Geneva to be a gloomy haven for killjoys, and at one point it was widely rumored that the French reformer had personally abolished Sunday, banishing divine rest from the week. The accusation of hostility to church festivals dogged him most of his years as a reformer but was not true. Certainly, the Reformation witnessed the scrubbing of the Christian calendar through the removal of saints’ days and various traditional feasts, but Christmas remained central to the life of the new churches. Reformed Protestants of the sixteenth century continued to celebrate Christmas and Easter, marking the birth, death, and resurrection of Jesus Christ, along with Pentecost and Ascension. For the sixteenth-century Reformers, it was one thing to remove the superstitious veneration of saints but entirely another to follow through the year the life of Christ as told in the gospels. Calvin sought to reclaim Christmas as a celebration of Christ’s Nativity, a defining moment for Christians, without making the festival binding on the faithful. At the same time, his intention was to purge the holiday of the excesses of public exuberance traditionally associated with both the feast and what he viewed as the “abomination” of the Mass. It was a difficult balancing act and one not followed by his first spiritual descendants in the English-speaking world. The hostility of later Puritans and Presbyterians to Christmas as a pagan and popish innovation, occasionally called “foolstide” in England, was anticipated by Calvin, who sought to persuade his contemporaries not to make the issue of religious holidays a matter of conscience. In seventeenth-century England, the twelve days of Christmas were traditionally celebrated with feasting, dancing, and general revelry, drawing the sustained ire of Puritans. One disapproving figure reflected that the youth were “so addicted to their toys and Christmas sports that they will not be weaned from them.” The Puritans sought to turn Christmas into a fast day, with an act of Parliament in 1643 declaring that it should be observed “with the more solemn humiliation because it may call to remembrance our sins, and the sins of our forefathers who have turned this Feast, pretending the memory of Christ, into an extreme forgetfulness of him, by giving liberty to carnal and sensual delights.” Two years later, the Directory of Public Worship was unequivocal that feasts such as Christmas had no warrant in scripture. The attack on Christmas in England was sustained, fierce, hugely divisive, and ultimately a failure. The festival was restored under Charles II in 1660 to much public acclaim. North of the Scottish border, when Christmas was abolished by Parliament in 1640 it was declared that “The kirke within this kingdome is now purged of all superstitious observatione of dayes.” The legacy lasted almost four hundred years, and Christmas was not restored as a public holiday in Scotland until 1958, remaining to this day very much in the shadow of Hogmanay (New Year). Across the Atlantic, the Puritans of New England demonstrated their contempt for Christmas festivities by ensuring that the day was filled with godly labor. Such hostility to Christmas among later Calvinists obscures our understanding of the Frenchman’s own thoughtful and subtle perspective. While Calvin would never have approved of the excesses and worldliness of the Christmas celebrations so despised by Puritans and Presbyterians, he remained profoundly attached to the marking of Christ’s Nativity in the life of the church, and he was not alone. The question of feast days and whether they were appropriate for Christians was important for Calvin because it spoke to the freedom of faithful men and women. Calvin briefly addressed the subject of Christmas on a few occasions, seeking to reclaim the festival, as his sermon declared, as a time of joy. The two most significant references come from the 1550s, a particularly fraught time for the Reformer as he faced a range of opponents, including those on the ruling council of Geneva. In 1553, Reformation Europe had been rocked by the trial and execution in Geneva of Michael Servetus, who was condemned as a heretic, wrongly in the eyes of Calvin’s many critics. Hostility between the Reformed and Lutheran churches over the Lord’s Supper reached a high water mark, while Calvin battled with the church in Bern, a powerful city that sought to establish its control over its client Geneva. has given grievous offense to some of your people [in Bern] and it is likely enough that much unpleasant talk has been circulating among you. I am pretty certain, also, that I get the credit of being the author of the whole matter, both among the malevolent and the ignorant. But as I can solemnly testify that it was accomplished without my knowledge and without my desire, so I resolved from the first rather to weaken malice by silence, than be over-solicitous about my defense. Before I even entered the city, there were no festivals but the Lord’s Day. Those celebrated by you [in Bern] were approved by the same public decree by which Farel and I were expelled; and it was rather extorted by the tumultuous violence of the ungodly, than decreed according to the order of law. Since my recall, I have pursued the moderate course of keeping Christ’s birth-day as you are wont to do. What did Calvin mean by “moderate” course? For him, religious holidays fell into the category of external matters, or adiaphora, as he pointed out to the magistrates of Bern in 1555. “Respecting ceremonies,” he wrote, “because they are things indifferent, the churches have a certain latitude of diversity. And when one has well weighed the matter, it may be sometimes considered useful not to have too rigid a uniformity respecting them, in order to show that faith and Christianity do not consist in that.” Whether a church chose to mark Christmas was to be left to its own judgment. Calvin was personally in favor, but he did not want the festival made a litmus test for faithfulness. That standard was found alone in obedience to the Word, which any true festival should proclaim and celebrate. Moreover, if the churches do religiously celebrate the memory of the Lord’s Nativity, Circumcision, Passion, Resurrection, and of his Ascension into heaven, and the sending of the Holy Spirit upon his disciples, according to Christian liberty, we do very well approve of it. But as for festival days, ordained for men or saints departed, we cannot allow of them. Like Calvin, Bullinger saw the celebration of Christmas and other festivals as a matter of Christian liberty—as among those matters left to the church to decide according to its faithful interpretation of the Word of God and for the good of the particular community. Particularly in the transatlantic worlds of Puritanism and Presbyterianism Christmas formed the center of an ideological battle between competing visions of true religion. The principles concerning the freedom of the Christian that marked the attitude of Calvin and other figures of the Reformation were lost in the cacophony of arguments of a later, bitter age. Calvin’s name might be readily associated with hostility to Christmas, but that would be news to him. 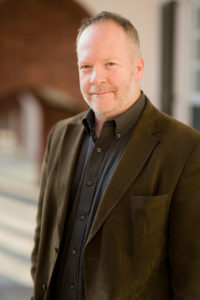 Bruce Gordon is the Titus Street Professor of Ecclesiastical History at Yale Divinity School. He also teaches in the history department at Yale. The focus of his research has been on the Reformation, particularly in German-speaking lands, and the Reformed tradition. He has written a biography of John Calvin (Yale, 2009) and, recently, John Calvin’s Institutes of the Christian Religion: A Biography (Princeton, 2016). He works on cultures of death and dying in the late-medieval and early modern periods, and is currently finishing a book on Protestant Latin Bibles in the sixteenth century. This material is licensed under a Creative Commons Attribution 4.0 License. Can We Still See Calvary from Bethlehem?